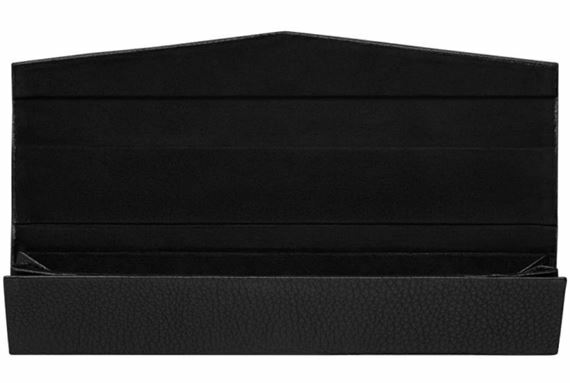 Order your Montblanc Leather Single Pen Pouch - Black today from FahrneysPens.com. Fine Pens, Refills & Luxurious Gifts – great prices & fast shipping. The 1 Pen Pouch Foldable is crafted using the grained leather of the Meisterstück Soft Grain collection, which gives the product a soft and natural feel. This pen pouch is the result of a special design and manufacture process: when the product is empty, it folds up for a very slim appearance; when it is fitted with a writing instrument, it unfolds into a unique triangular shape on the sides. The flap, which features the Montblanc emblem with a palladium-coated ring, closes with a hidden magnetic button.